Enlightened Space: Will LED Lighting Be The Backbone of the Smart City? The rise of the Internet of Things (IoT) will forever transform the urban landscape as it begins to permeate our cities with a robust distributed network of unique sensors that can actively communicate with one another to deliver information about their surroundings and/or execute specific tasks. The migration of the internet from cyberspace to the real world is intrinsic to the concept of the Smart City. The network can provide streams of data for helping us make more informed decisions about the design and management of public space as well enable environments to be more responsive. According to BI Intelligence, the amount of devices comprising the Internet of Things (IoT) is expected to grow to over 9 billion by in 2018. Some industry leaders have even estimated IoT devices will exceed one trillion by 2022. Either way the growth of these devices is staggering. Designers of the urban environment will soon be faced with the issues of how and if to incorporate and utilize the IoT Smart City infrastructure. The humble and ubiquitous area light has undergone a considerable transformation itself over the last few years and could be the backbone making this future possible. As LED lighting is quickly becoming the de facto standard for new outdoor illumination and existing luminaires are being replaced with LED fixtures everyday to reduce energy consumption, lighting’s power systems are aligning with those of electronic systems. 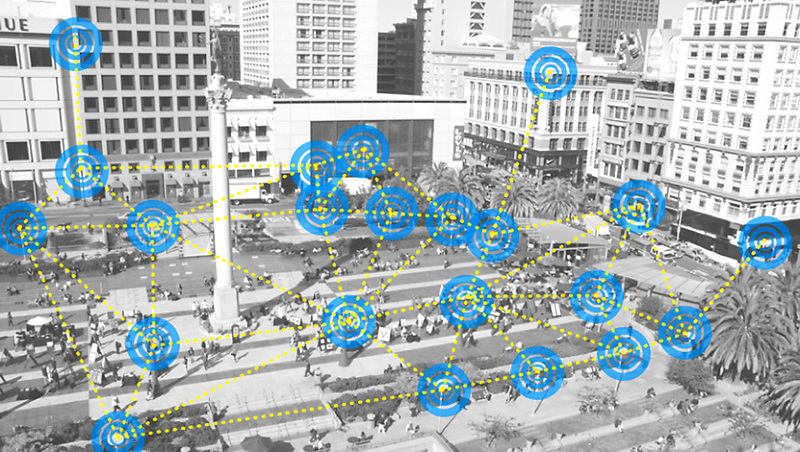 This commonality and conversion may be the key to accelerating the proliferation of a Smart City sensor network by providing an existing platform for deploying it in the landscape. Imagine every light fixture having the potential to include a multitude of embedded sensors with access to the internet and the ability to communicate with one another and other devices. Companies are taking notice of this potential and developing integrated solutions that establish a platform for developers to build upon. In fact, Sensity Systems, who started out focusing on LED conversion, imagines a future where they are more of an information enterprise rather than a lighting company. The NetSense platform is the centerpiece to their new strategy. It is now being integrated into their luminaires. The system expands beyond alerting managers of problems with fixtures or providing automatic controls depending on movement and/or light levels. According to GCN.com, the initial basic NetSense enable lights incorporate sensors for tracking power consumption, temperature, vibration, movement, and ambient light. Additional imaging sensors and microphones can also be added. The network functionality will allow them to not only communicate with other NetSense enabled lights but hopefully other internet connected devices and sensors. Examples of applications that have been mentioned by the company ‘s literature and/or in various articles covering the company include parking management, retail analytics, asset tracking through RFID tags, pollution monitoring, gun shot triangulation, and even seismic recording for earthquakes. Other compelling applications could include real-time public life metrics and environmental monitoring. The company is currently in beta and is working with selected software developers to build applications utilizing the NetSense platform. The platform is expected to have an Application Program Interface (API) available that will facilitate the development of future applications by third-party developers. It will be interesting to see the types of applications are developed. In February, New York Times reported about Sensity’s NetSense deployment at the Newark Liberty International Airport for energy efficiency and management of drivers and pedestrian. The report raised the obvious privacy concerns systems like NetSense inevitably stir up, particularly when video surveillance is involved. How to manage such concerns is being addressed by the company. In a recent interview with Venture Beat last Fall, Hugh Martin, the CEO of Sensity Systems, reportedly stressed that the company would be actively engaging with the ACLU and hiring a Chief Privacy Officer. The initiative is promising and will be important to the long-term success of the system. Some manufacturers like Amerlux are already beginning to license the NetSense technology for inclusion in their own lights. As the platform matures, we will likely see others manufacturers begin to incorporate the technology as well. This will be a welcome development because while the technology is intriguing the current light options are aesthetically disappointing from a design perspective. Other manufacturers are moving into the space with their own visions and platforms. Illuminating Concepts is one of these players. Their IntelliStreet platform provides a mesh network of street lights that can communicate with one another. By integrating the network with computer controlled digital banners and music, the system appears to be focused more on the entertainment and retail districts. The system also offers pedestrian counting, emergency call boxes, and security features. Having choice in system is a wonderful luxury, but it can also stymie the adoption of the overall vision of the Smart City network due to compatibility concerns between devices. How will all of these systems work together and what walled gardens will be created as each system vies to be the dominant platform for the Smart City? This is a wide spread problem when it comes to successfully implementing the Internet of Things (IoT) in general. Dominant players in the IoT space are recognizing this and have founded the Industrial Internet Consortium (IIC). Companies like AT&T, IBM, Cisco, General Electric, and Intel are working together with government and academia to standardize the IoT ecosystem. Without this type of cooperation, the vision will have a tough time becoming a reality. The importance of this was underscored during a recent conversation with a lighting designer about the future of wireless lighting controls. They have been reluctant to adopt it over concerns of interoperability between systems and the difficulty of meeting the procurement requirements of cities this can present. Despite the many hurdles to ushering in the Smart City network, it seems the future of an interconnected and responsive urban landscape may be here before we know it and LED lighting may be the key to making it happen. This entry was posted in Smart Cities and tagged Industrial Internet Consortium, Internet of Things, IoT, Landscape Architecture, LED Lighting, Lighting, Metrics, Sensor Network, Smart Cities, Urban Design. Bookmark the permalink.